Elizabeth prefers not to experience FOMO. The best way to not miss out on a show is to volunteer. Whether she’s operating the lights & sound in the booth or managing the front of house, she is happy to be helping out (and in a building full of hilarious humans). When on the stage, you can see Elizabeth performing at Harold Nights, with her indie troupe Stand Up for Whaaa? born from the Fighting Improv Smackdown Tournament (FIST), or performing stand up in various venues around the Washington D.C. area. Elizabeth began improvising in a very boring and predictable way—by following through on a beer-encouraged brag announced at an office happy hour. Elizabeth has been making her family laugh since 1991 and now enjoys the new challenge of making strangers laugh. While her theater roots technically go back to summers enrolled in Round House Theater youth programs, she was shy enough to last-minute avoid any talking or singing roles (does that still count?). 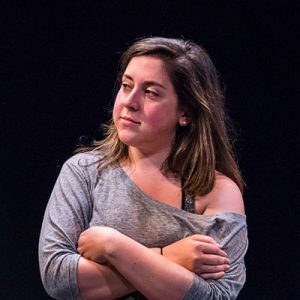 While enrolled in the WIT curriculum, Elizabeth was empowered to take a stand-up class at the DC Improv and you can now find her performing in venues around the Washington D.C. area and in Baltimore. Elizabeth is originally from Kensington, Maryland, but took the Red line into the city one day and the delays have kept her here. She is a self-proclaimed blogger, Twitter expert, and Netflix binge-watch champion. Her weakness is a well-proportioned mimosa with the correct orange juice-to-champagne ratio.